Fun at my Lovely Local Library – and an intriguing new find! … in which I discover Joyce Carol Oates – and also explore e-reading a little more! Well I have only read Suite Francaise and the Dimanche and other stories collection but I definitely want to read much more. I love the sound of both these novellas that you’ve read recently. Not even remotely last Karen – you can always rely on my to chase up the rear! Must get a copy – thanks. I’m in the rear also. I started it but never finished it. I’ve always been meaning to try again so now I will thanks to this review. Yay! I was the same but this time was just right for me. Hope you enjoy it! I like your description, and also the word “novella”! I will be quite busy in the next few weeks as my daughter is doing exams, and not sure I will be able to read at all, but a novella might be do-able. Novellas are great when you can’t squeeze in a whole book – and these are lovely! You’re not quite the last. my copy of Suite Francaise is still unread, and you’ve definitely tilted me towards going to look for it. 🙂 It’s a wonderful read – I’m glad I finally found the right time to read it and I hope you do too! What a lovely review. 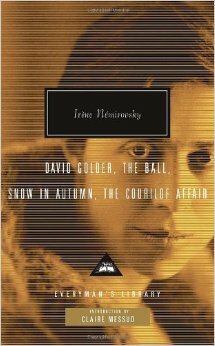 I keep meaning to read Nemirovsky – I really enjoyed her short story Dimanche, but have no idea where to start with anything else. I’ve always thought of her longer work as being rather difficult, but you make her sound very accessible. I found her really accessible this time round, and these novellas are a good place to begin – they give a sense of her style but without needing the commitment to a longer work. Nevertheless, I found that I sailed through Suite Francaise recently! I really think she did – they all seem to draw from her past and there’s a variety here, too. I’m reading about a lot of her other novels online, and to be honest they sound a little similar, so I’m not sure what of hers to head for next!